Melissa Turner is a self-employed Geographic Information Systems Consultant in Winnipeg, Manitoba. If anyone asks, she just says “I’m a geographer.” Ms. Turner earned a BA in Geography from the University of Manitoba in 2007. Her studies focused on Sustainable Resource Development, Living Rural Communities and Environments, and the Geography of Environmental Changes. For the past seven years, her professional focus has been on providing GIS services to First Nations in Northern Manitoba and Western Ontario. 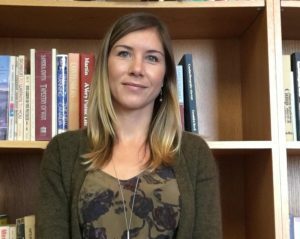 As the GIS Lead on many Traditional Knowledge, Land Use and Occupancy Studies, her work aims to engage First Nation members in documenting their traditional knowledge, land-use patterns and occupancy of Indigenous peoples in their traditional territories. This work contributes to meaningful engagement and consultation with resource developers on behalf of First Nations, as it helps to describe intimate connections to their traditional environment. Prior to her experience working with First Nations, she held multiple contracts with the agricultural and mining industry, business intelligence analytics industry and conducted water-main audits for many towns in Western Canada. When she’s not busy making maps, Ms. Turner can be found outdoors with her family, cycling or gardening. This entry was posted in Home. Bookmark the permalink. Both comments and trackbacks are currently closed.